My mother, Alberta Joy (Gardner) Brown, always sewed, having learned from her mother. She made most of her own clothing in high school. She sewed her own wedding dress, gathering yards and yards of white organdy. She sewed pajamas for my brothers from soft flannels printed with tiny cowboys. She made me little pink or yellow dresses with pretty buttons shaped like flowers or kittens. My mother secretly sewed doll clothes for Christmas for my cousins and me. Everything looked like it came from an upscale store. This is my mother’s Singer sewing machine which was equipped with the very latest options. The drawers of the cabinet had a wide array of thread colors, buttons, pins, snaps, zippers and scissors. I remember the hum of this machine as my mother’s hands guided the fabric pieces under the needle. Her head would be bent as she watched her most recent creation come together. She never had a sewing room, just a spot in the hall or the corner of a bedroom but it did not stop her from making delightful original items. She was always happy when she could find time in her busy schedule as mother of four children to sit & sew. My mother’s machine has not been used in many years but it has a safe home in our house along with her mother’s sewing machine and my own sewing machines. I have decided to begin with my grandparents and to work back through the generations. Of my eight great grandparents only two were still living when I was born. Regina & her husband were living in Ohio. I was a little girl when Regina died and, unfortunately, I do not remember her. Regina was the youngest daughter of Augustus Ceaser Gruissy and Esther Barbara Wolf. The couple had five children but only two grew to adulthood. Regina’s older sister was Rephenia Cathern (Gruissy) Nichols. She also had half siblings. In 1880 Augustus Gruissy, his wife and five daughters were in Wadsworth, Medina, OH. Augustus was a peddler. The youngest daughter was Nancy Regina. There are few references to this daughter as Nancy. When I began researching my great grandmother I discovered that some of her children did not know her first name was Nancy. She was most often called Regina. Regina and Thomas K Mark both worked at the Medina County Home. When Thomas first saw Regina he told the other guys to leave her alone, she was all his. On 28 Jan 1903 Thomas married N Regina Gruissy. They were both 23 years old when they married. I am fortunate to have copies of letters written between my great grandparents. There are also letters written between Regina & her mother and other relatives. 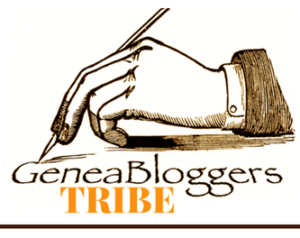 I will be sharing some of those letters in future posts. In 1910 Thomas & Regina were renting a farm in Westfield Twp., Medina, OH. They had three little girls: Isabell, Vera & Ivy. In 1920 the Mark family was on Prospect Street, Guilford Twp., Seville Village, Medina Co., OH. Thomas was a carpenter and Regina was the mother of 7 children, ages from 16 to 11 months old. In 1930 Thomas & Regina were living in Guilford, OH. Four children were still at home. In 1940 they owned their home at 181 Bergey Street, Wadsworth. Three children were at home. My Aunt Gen remembered her grandmother. She said Regina was an immaculate housekeeper. There was never a speck of dust in her house. Each item had a particular place and she made sure everything was in its place. She would do her cleaning in the morning, make lunch, clean up the kitchen and then take a nap. She kept an afghan on the sofa. She’d stretch out, cover herself with the afghan and nap for half an hour. Then she’d get up, revitalized. Gen remembered going to her grandparents’ house after Regina died. Her grandfather and one of her uncles were living there. She looked around and there was dust on the furniture. That was something Gen had never seen while her grandmother was alive. Her granddaughters said Regina liked to crochet, make quilts and garden. She made quilts for her children. She sewed little dresses for her granddaughters. Regina died 24 May 1959. She is buried in Woodlawn Cemetery in Wadsworth, OH. Once Gen went to Wadsworth Cemetery with her grandmother. Regina showed her granddaughter the plot where she would one day be buried. She said she chose the spot because she "would feel the sun on her face in the morning." Nancy R. Gruissy. b.30 Jan 1879. 1880 U.S. Census, Medina County, Ohio; 1880; Vol. 44, E.D. 199, Sheet 41; Line 26; National Archives, Pittsfield Region, Mass., T767Roll48; Note: Augustus Gruissy family in Wadsworth Twp. Letter from Wava Mark Braun to Colleen G. Pasquale in Averill Park, NY; Letter dated 25 Oct 1994; NOTES: Information on the Gruissy Family. Probate Court, Medina Co., Ohio, License & Certificate # 780 Thomas K. Mark & Regina V, Gruissy, m. 28 Jan 1903. 1910 U. S. Census, Medina Co., Ohio; 7 May 1910; E. D. 144, Family#237; ; Federal Archives, Pittsfield, Mass., T1272 Roll M620 (Soundex) and T624 Roll 1205 (Report); Thomas K. Mark and family in Westfield Twp. 1920 US Census Soundex, Ohio; 1920; Vol.147, E.D.67, Sheet 5; Line27; Family History Center Microfilm #1828900; NOTE, Prospect Street, Seville, Medina Co.; Thomas K Mark family. 1930 U. S. Census, Guilford, Medina, Ohio, SD 4, ED 52-5, Sheet 11B; Thomas K Mark family. 1940 US Census, Wadsworth, Medina, OH; SD 23, ED 52-25, Sheet 27A; Thomas Mark family. Death Certificate for Regina Mark; Ohio, #5201; 1959; Ohio Dept. of Health, Division of Vital Stats; 24 May 1959. The Medina County Genealogical Society, Tombstone Inscriptions from the Cemeteries in Medina County, Ohio, 1983. Evansville, Indiana: Whipporwill Publications, 1984. Thomas & Regina Mark. "Last rites for Mrs. Ada Fortenberry Brumfield were conducted Tuesday from the Silver Springs Baptist church at 3 p. m. She was 62. The Reverend Joe Lovelady and the Reverend Bartis Harper conducted services and officiated at graveside for Mrs. Brumfield who died in McComb Sunday. Pall bearers inclded: Ray Fortenberry, Wilburn Fortenberry, Pur Schilling, Emmett Fortenberry and Milton Fortenberry. 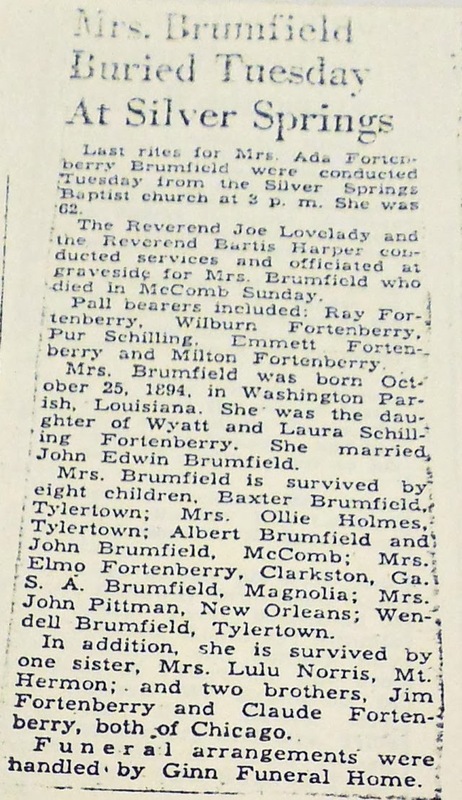 Mrs. Brumfield was born October 25, 1894, in Washington Parish, Louisiana. She was the daughter of Wyatt and Laura Schilling Fortenberry. She married John Edwin Brumfield. 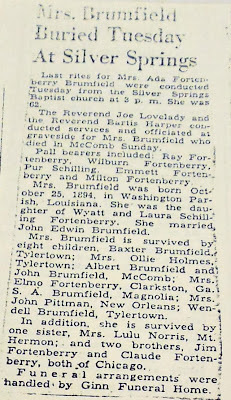 Mrs. Brumfield is survived by eight children, Baxter, Tylertown; Mrs. Ollie Holmes, Tylertown; Albert Brumfield and John Brumfield McComb; Mrs. Elmo Fortenberry, Clarkston, Ga; S. A. Brumfield, Magnolia; Mrs. John Pittman, New Orleans; Wendell Brumfield, Tylertown. In addition, she is survived by one sister, Mrs. Lulu Norris, Mt. Hermon; and two brothers, Jim Fortenberry and Claude Fotenberry, both of Chicago. Funeral arrangements were handled by GInn Funeral Home." The Washington Parish Library in Franklinton, LA has, among its various genealogical records, this typed report written by the Honorable Prentiss Carter. It is only a few pages in length but filled with information. The report is not dated but the pages are yellowed with age. 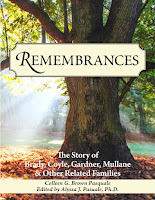 My Alford & Brumfield ancestors are among the early settlers he writes about. Unfortunately the final page of this report is missing. We can only wonder what other insights he shared on that page. I have decided to begin with my grandparents and to work back through the generations. Of my 8 great grandparents only Thomas & his wife were still living when I was born. Because Thomas lived so far away I saw him rarely and have only vague memories of this gentle man. ThomasK Mark was the son of William Mark & Elidia Rebecca Ritter. He was the second of 11 children. His siblings were: George Washington, Margaret Maude, Emma Jane, William Hercules, Mary, Amos Martin, Eslie Guy, Charles Forest, Elva Gale & James Everett. 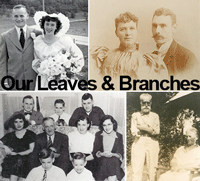 In 1880 the William Mark family was in Wayne Co., OH. William was a day laborer. Thomas was one of 5 children at home. By 1900 Thomas was living with Eli Reed in Lafayette, OH and working as a farm laborer. On 28 Jan 1903 Thomas married N Regina Gruissy, the daughter of Augustus Ceaser Gruissy & Esther Barbara Wolf. They were both 23 years old when they married. According to a grand daughter, Thomas K. Mark did not know how to read when he got married. Regina taught him to read, using the Bible. 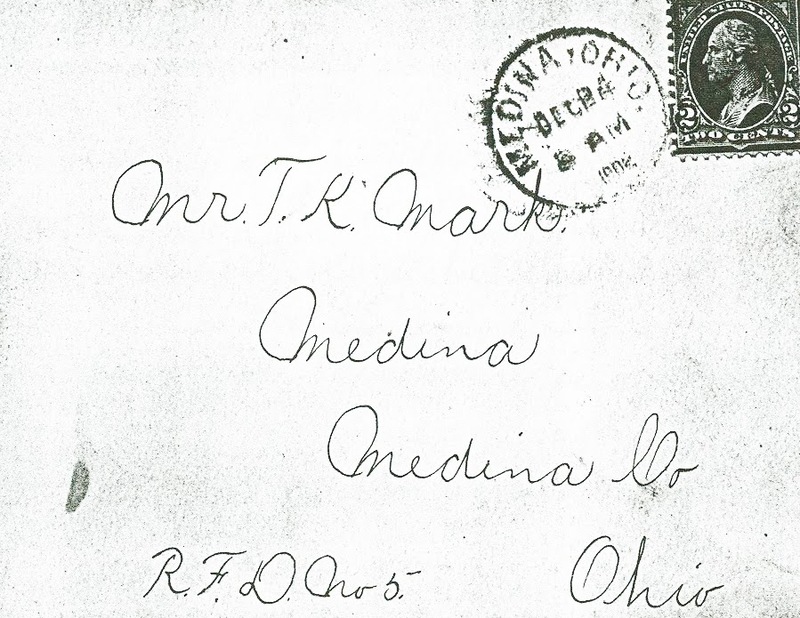 In 1910 Thomas & Regina were renting a farm in Westfield Twp., Medina, OH. They had three little girls: Isabell, Vera & Ivy. Thomas worked as a farmer and a carpenter. His daughter, Ivy, said he would buy a house, fix it up, sell it and buy another one. He did this about every 3 to 5 years. The 1920 census shows him to be a carpenter. Thomas helped to build summer cottages on Chippewa Lake, a summer resort in Medina Co., OH. In 1930 Thomas, 50 years old, was still using his carpentry skills. He & Regina were living in Guilford, OH. Four children were still at home. Even after an accident that injured his back, Thomas continued building things. My great grandfather lived a long life. My mother said they would, on occasion, get word from Ohio that he was not well and the New York relatives should come and say good bye. Relatives would quickly pack up and make the drive to Ohio only to find him in improved and good health. 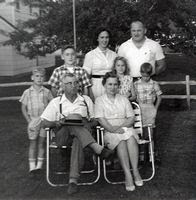 I remember rare visits to Ohio when I was a child but I was overwhelmed by all the relatives and often did not understand how they were connected to me. A clipping from an unknown newspaper wrote about Thomas’ 95th birthday. Thomas died 12 February 1975. He and Regina are buried in Woodlawn Cemetery in Wadsworth, OH. The last of their children died in 2011. Thomas has many descendants still in Ohio and others scattered across our country. One of my cousins is a talented carpenter and I think he inherited his skill from Thomas. Birth Record for Thomas K. Mark, 19 July 1879, Volume 2, Page 200, #25, Wayne Co Probate Court, Court House, 107 W Liberty St., Wooster, OH. 1880 US Census Soundex, Ohio; 1880; Vol.67,E.D. 226 Sheet 29; Line 35; Family History Library Microfilm #0448458; History Center Microfilm #0448458; William Marks family. 1900 US Census; Medina Co., OH Vol.105 ED45 Sheet 6 Line 74 FHC Microfilm #1241302: Thomas K. Mark. 1910 U. S. Census, Medina Co., Ohio; 7 May 1910; E. D. 144, Family#237; ; Federal Archives, Pittsfield, Mass., T1272 Roll M620 (Soundex) and T624 Roll 1205 (Report); Thomas K. Mark family in Westfield Twp. Interview with Ivy (Mark) Brown (Sept. 1993). 1920 United States Census, Medina County, Ohio; Volume 147, ED 67, Sheet 5, Line 37, Family History Center Microfilm # 1821417: Thomas K. Mark family. Information from Clarence William Mark; 1811-1950's; The Mark & Gruissy Families; written Oct. 1994. Certificate of Death for Thomas K Mark; Ohio Dept. of Health, Div. of Vital Statistics, Certificate of Death, Primary Reg. Dist. #5201, State File #021347, Reg. #19 Thomas K. Mark. Magee, Zuma Fendlason. Selected Obituaries from Louisiana (Washington & Tangipahoa Parishes) and from Mississippi (Pike, Walthall & Marion Counties). Volume I. Franklinton, Louisiana: Privately printed, 1976. I found this wonderful book in the Washington Parish Library in Franklinton, LA. It has yielded lots of family details. It looks like Ms. Magee clipped and saved newspaper obituaries. Then she alphabetized them. She laid them out on sheets of paper and photocopied the pages. The obituaries give lots of information including occupations, membership in organizations and churches, parents, and survivors. The down side of these clippings is there are very few dates. We do not know the name of the newspapers or the dates they were published. I have decided to begin with my grandparents and to work back through the generations. Here is Rose, my father's paternal grandmother. Rose was the daughter of Jessie Alexander Brumfield & Martha Elizabeth Alford. Rose was the oldest daughter. Her siblings were: Martin, John, Fletcher, Lily, Daisy, Lucy, Sallie & Newton. 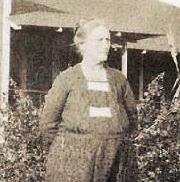 In 1870 Jessie and family were in Osyka, Pike, MS. Jessie was a farmer and Martha was the mother of 3 children. Rose was 4 years old. In 1878 she was in school. In 1880 Jessie was still farming. Oldest son, Martin, was helping on the farm. In 1885 Martin, Rose, John, Fletcher, Lily & Daisy were attending a local school. On 21 December 1887 Rose married Jasper Pascal Brown, son of Allen Moses Brown and Emmaline Smith. Jasper was 21 and Rose was 18. Jasper and Rose were second cousins. 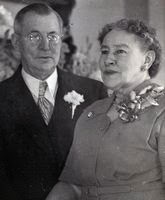 Rose’s grandmother, Martha P. Smith Alford, and Jasper’s grandfather, Wyatt Smith were siblings. Martha and Wyatt were the children of Jeremiah and Joanna Smith. In 1900 Jasper and Rose were still in Pike, MS. Rose was the mother of 6 children, all living: Lucy, Ina, Junius, Herbert, Mavis & Baby. Lucy, Ina, Junius & Herbert were in school. 1910 shows Jasper a farmer on his own farm and Rose as the mother of 9 children. In 1912 6 of the children were in local schools: Thelma 5, Mildred 8; Roy 11; Lyda 13; Mavis 15 and Hubert 17. In 1920 Jasper was still farming in Pike, MS. Sons, Hubert & Roy were helping on the farm. Roy, Mildred & Thelma were attending school. Sometime between 1920 & 1930 Jasper & Rose moved to William Road in Washington Parish, LA. In 1930 Jasper was 64 & Rose was 63. Two grandchildren were with them: Bernarr [son of Thelma Lady Brown] & Joseph [possibly the son of Junius]. Their son, Junius, lived next door. In 1940 they were back in Pike, MS. Jasper was still farming. Bernarr was still with his grandparents. I am fortunate that my aunt has shared some memories of Rose; snippets that bring her to life. Granddaughter, Gen Brown, remembered that her Grandma Brown’s house smelled like lemons and tea. When her son, Roy’s family, drove down from Ohio to visit Rose put big feather mattresses on the floor for them to sleep on. When the children lay down to sleep, their grandma knelt down to kiss them each good night. Gen also remembered when her grandmother visited them in Ohio. Gen was just a little girl. She went into the bedroom with her grandmother while her grandmother changed her dress, out of her travel dress. Gen saw that her grandma had money pinned into the bodice of her slip. Rose told her granddaughter that travel was not safe; there were robbers on the roads so she pinned her money in her slip to keep it safe. I never met Rose. She died before I was born. Rose Ella Brumfield Brown died 2 October 1948 in MS. Jasper died of bronchial pneumonia 8 June 1950 in MS. They are buried in Silver Creek Cemetery, MS.
 1870 US Census, Osyka, Pike, Mississippi, Roll M593-745; Jesse Bromfield family. Haymon, Serena Abbess. Pike County, Mississippi School Census, 1878. Greenwell Springs, LA; children of Jessie Brumfield. 1880 Census. Pike Co., Miss. ED 37 SD 3 Page 54 taken 29 June 1880. Alek J Brumfield family. Haymon, Serena Abbess. Pike County, Mississippi School Census, 1885. Greenwell Springs, LA. Children of J Alex Brumfield. Index to Marriage Record, White, Vol. I; 1882-1942; Pike County Court House, MS; Family History Center Microfilm #0907286; page 35. Brown, Jasper P. 14 Dec 1887. Brumfield, Rosa E. Book P, Page 354. Marriage Bond; 1887; The State of MS, Pike Co.; Page 354; Jasper P. Brown and Rosa E. Brumfield, Married 21 December 1887. 1900 US Census, Beat 1, Pike Co., Mississippi; Roll T623 825 Page 14B, ED104. Jasper P. Brown family. Haymon, Serena Abbess. Pike County, Mississippi School Census, 1900; J P Brown children. 1910 U.S. Census, Pike Co., Mississippi; 1910; ED95, Sheet 11; Line15; Federal Archives, Pittsfield, Mass., T1269 Roll 13 (Soundex) T624 Roll 756 (Report); Jasper Brown & family. Haymon, Serena Abbess. Pike County, Mississippi School Census, 1912. Children of J P Brown. 1920 U.S. Census, Pike Co., Mississippi; 1920; Vol 48, ED 99, Sheet 6; Line 61; National Archives, Pittsfield, Mass., M1570 Roll 14 (Soundex) T625 Roll 891 (Report); Jap P. Brown family in Simmonsville Precinct. Haymon, Serena Abbess. Pike County, Mississippi School Census, 1920. Children of J P Brown. 1930 US Census; Washington County, Louisiana; Jasper P. Brown family on Williams Road. 1940 US Census, MS, Pike, SD 7, ED 57-3, Sheet 2B. Jap P Brown on Walker Bridge Road. Death Certificate State File #16010, Registrar's # 264, Mississippi; Rosa Ella Brown. Certificate of Death; 1950; Mississippi State Dept. of Health, Vital Records; 9908; Jasper P. Brown, died 8 June 1950 in Pike Co., Mississippi.